Updated Sunday November 6, 2016 by ABR. Sign your child up for the level of play that corresponds to your child's age (your child's age on April 30 of the current year). There will be a disparity of skill level on all teams, that is to be expected and has some benefits. Scroll down the page to find the applicable level for your child. 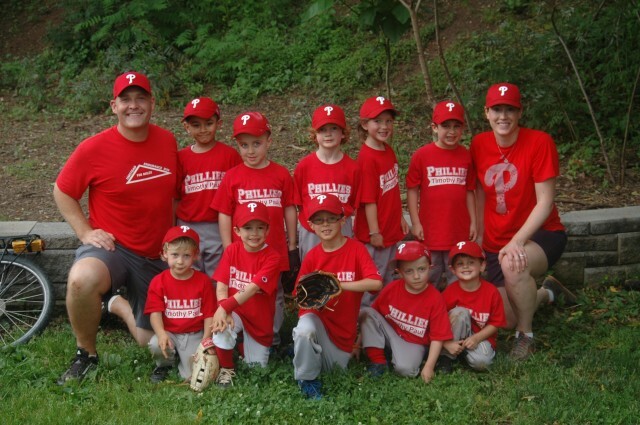 Introduction to baseball with small teams, simple rules, soft ball and light weight bat. New Game & Derby system combines traditional game play with imaginative team-and-skill-building exercises to maximize player touches, development and fun! Two games or practices each week starting mid-March, ending early June. Every effort is made by coaches to keep the games moving quickly. Players receive a participation medal at the end of the season. Click the link in the left hand menu for rules of play for Blastball. The goal is to provide players with a fun introduction to baseball & to create an enjoyable social experience. Players learn the basics of batting using a batting tee and build catching and fielding confidence enhanced by soft, but lively safety ball. Every effort is made by coaches to keep the game moving quickly. Once or twice a week practices starting mid-March. Twice a week games (one during the week, one on Saturday) starting early to mid-April, ending early June. Players receive a participation medal at the end of the season. Teams of no more than 10 players. Keep a continual batting order so that each player bats about the same amount of times during each game. Rotate fielding positions each inning; infield to outfield. Use of tee only (no coach pitch at this level). 45-60 minute games twice a week (10 games). Use safety balls #1 (softer safety ball). The goal at each game is to play each inning in 15 minutes or less (approximately 7 minute half innings) and 3 innings per 45 minutes. Click the link in the left hand menu for rules of play for T-ball. At this level, players are introduced to coach pitch (no pitching machines) and will develop hitting, base running, fielding, and throwing skills, as well as a better understanding of the concepts and strategies of the game. Like T-Ball, emphasis is placed on keeping the game moving and providing as many "touch opportunities" as possible. Team rosters of no more than 11 players (only 8 play in the field - each position minus the catcher). All players bat per half inning. Two games per week and maybe one practice per week. Coach pitches to batters from one knee, no machine pitching. Parent first baseman (recommended) to avoid collisions and allow players to throw to first full speed. The goal at each game is to play each inning in 15 minutes or less (approximately 7 minute half innings) and five innings in 75 minutes. Click the link in the left hand menu for rules of play for Single A. At this level, players refine their hitting with coach pitch (no machines) and will develop more proficiency in hitting, base running, fielding, and throwing skills, as well as a better understanding of the concepts and strategies of the game. Like T-Ball and Single A, emphasis is placed on keeping the game moving and providing as many "touch opportunities" as possible. Team rosters of no more than 11 players (only 9 play in the field). 3 outs or 5 runs max per half-inning. Scorebook is kept, but no league standings. Use safety ball #1 (softer safety ball). Coach pitch to batters from one knee, no machine pitching. No stealing and base runners may not advance on passed balls. The goal at each game is to play each inning in 15 minutes or less (approximately 7 minute half innings) and six innings in 75 minutes. Click the link in the left hand menu for rules of play for Double AA. Players are introduced to kid-pitch at an appropriate age level. Players will develop proficiency in pitching, catching, hitting, base running, fielding, and throwing skills, as well as a better understanding of the concepts and strategies of the game. More emphasis is placed on skill development. Like T-Ball, Single A and AA, emphasis is placed on keeping the game moving and providing as many "touch opportunities" as possible. Team rosters of no more than 12 players (only 9 play in the field). 3 outs or 5 runs max per inning. Use Safety Ball #5 (not hard ball, but harder than safety ball #1). Mound distance is 41 feet (shorter than the 46 feet used in second year kid pitch and Majors). Two games per week and one or two practices per week. Kid-pitch to batters. If the pitcher throws four balls to a batter, the hitting-team coach will run onto the field and pitch to his batter. The coach throws from a standing position. The batter gets three pitches from the coach.There are no walks. Scorebook is kept. Standings are kept. Player catcher. If ball gets by catcher, the umpire will throw the pitcher another ball. The goal at each game is to play each inning in 15 minutes or less (approximately 7 minute half innings) and five (5) innings in 90 minutes. Post season may include Town Tournament / Sunday Pick-up Summer Games / Travel teams. Click the link in the left hand menu for rules of play for the Triple AAA First Year division. 3 outs per inning or 5 run max per inning. Regulation hard ball, 46 feet pitching mound. Two games per week and, at the discretion of the coach, one or two practices per week. Kid-pitch to batters. Walks allowed. Paid umpires. Umpire calls balls and strikes. Post season may include Town Tournament / Sunday Pick-up Summer Games / All Star teams. Click the link in the left hand menu for rules of play for the Triple AAA Second Year division. Players build upon the basic fundamentals learned at earlier levels. Two games and one practice per week, one during the week and one on Saturday. Games last two hours. Competitive, post-season travel teams for players at both levels. Two levels of play, for beginning and more advanced players, are described below in more detail. Majors 60' is geared for a first-year Majors division player, usually 10 or 11 year-olds coming up from AAA who are not ready to play on the larger size field. Team rosters will have no more than 12 players. Majors 60' will follow standard Cal Ripken Division rules with 46 foot mound and 60 foot bases. The Majors 60' division will be used as a spring board for player development towards the 50/70 field. Post-season may include Town Tournament / Sunday Pick-up Summer Games / Travel teams. Majors 70' is geared for a second-year Majors division players and the more advanced 11 and 12 year old player. Team rosters will have no more than 13 players. The Majors 70' Division will be played on a 50/70 intermediate baseball diamond. The 50-foot mound distance and the 70-foot bases will help ease players' transition from the Cal Ripken size field to the Senior Babe Ruth 90 foot diamond field. All players at this division will be subjected to a modified draft to create a more competitive playing experience for all. Post-season may include Town Tournament / Sunday Pick-up Summer Games / All-Star teams. Besides the distance between bases, players will begin to expand their overall baseball knowledge and strategy on the bigger field. Each player will grow their fielding and hitting approaches as it is played at the older levels. The Majors 70' division will be played using all Major League rules. The games will include players leading off the bases, reading pitcher's pickoff moves, balks, dropped third strikes and stealing. Click the link in the left hand menu for rules of play for the Majors 60' and 70' divisions. Occasionally there are highly skilled 10-year-olds who wish to play majors to stay with some of their previous year's team or with their father-coach, or to play with and against their friends. The priority for waivers is for 10-year old 5th graders. 10-year old 4th graders should state why the AAA 2nd year division (new rules) is not a better fit to meet their child's needs. In rare cases, there also are lower-skilled 11-year-olds who wish to play AAA due to skill level and the desire to stay with teammates or a coach. Again in these rare cases, if granted a 11-year old will not be allowed to pitch in AAA games. The board is an all-volunteer board and we also have minor administration concerns regarding granting waivers, which include both the reality and perception that we're being fair and applying the same rules to all, and the fact that when an accident occurs between children of differing ages, questions may be asked regarding our exercise of discretion in granting a waiver. Ultimately, we'd like to maximize fun for all.